While in London, I went through some growing pains that, no surprise, show up in the second trimester. I’ve had mild growth up until I hit about 20 weeks. But while we were there, between the walking and the days on my feet seeing the city, our little guy made some major growth which meant I was dealing with some sore ligaments, muscles, and shifting in my body. Which resulted in waking up one day to kicks just below my ribs and a bump that made me do a double take before getting in the shower. For a while, I felt chubby, but these days I feel much more purpose and gratitude for my body , more than ever before. I have a lot of grace for the shifts and changes happening every day than I did months earlier and best of all, I feel ease in it all. From here, I know that growth is going to be happening rapidly and in even a month I physically will be much more different than I am at this moment. As a woman I think it is easy to get lost in this haze of change that comes over us. Some days, all I want is to stay in sweatpants and an oversized sweater, but I have been trying daily to embrace the physical changes. At this point, there is no way of wearing normal pants. I haven’t given a belly band a go yet, because I have been living in regular leggings in thick fabrics and a single pair of maternity pants that have inset panels. To be honest, I have avoided buying much maternity and opted for buying one size up in sweaters or purchasing pieces meant to be drapey or oversized. I am stubborn and refuse to think I need to give in to the norm. I realize this theory may not be 100% and to make the most of my pre-pregnancy wardrobe, I need to find a few simple and essential pieces that will pack a punch over these coming months and even after our little guy has arrived, while I am bouncing back. Heading into fall and even the holidays, I know there will be events, dinners, parties, and more that I will need to attend. The idea of dressing up when you are pregnant can be slightly daunting. The process of putting on tights under a dress is a comedy act in and of itself, but on the other side you get to wear the most glorious thing offered to women: the dress. Nothing is better than a simple and basic dress that can be dressed up and down especially when you have a stacked social schedule. This gray 3/4 length sleeve dress from Liz Lange for Target was a discovery I am so glad I made. It is a piece perfect for any day, but pairing it with the right layers and accessories can be the key to feeling on your style game even when rocking your bump through the fall and winter seasons. Mixing the piece with a comfortable ankle boot, a blazer vest, and a long necklace makes for an outfit perfect for feeling yourself even when you are feeling a little oversized. There is no doubt you will be seeing me wearing this dress nearly all fall and winter layered with sweaters, coats, tights, boots, and more through the time till our little one arrives. All you mamas, what essential pieces did you survive on when pregnant? How did you maintain your style even while you rapidly changed? Show me your bump style, post a photo and tag me and #bumpstyle – seeing the creative ways you all are transitioning your wardrobes is nothing short of inspiring. If you want to see more of my bump growing you can see my personal Instagram. This post is sponsored by Target. For more baby inspiration, find us on Facebook and Pinterest. Beautiful! I lived in liz lange. Great design and INEXPENSIVE. You look great, Megan, and your bump is so cute! This dress is the perfect option for fall. Looking forward to seeing how you style it as it gets cooler out. YES! I love this look! 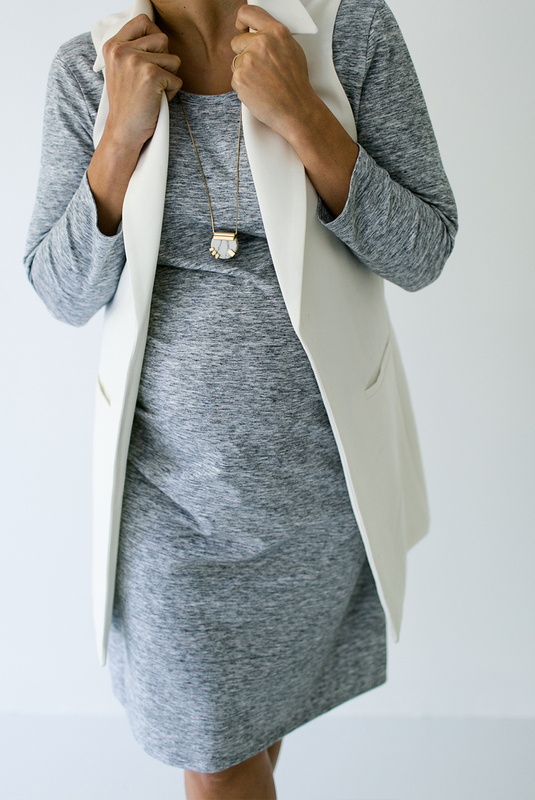 Even though I’m not having a baby (soon anyways…), this look can apply to anything! Thanks for sharing! yOU LOOK FANTASTIC! i LOVE THAT OVERALL LOOK. hAVE YOU SEEN THE sONNET jAMES DRESSES? tHEIR fALL LINE IS COMING OUT SOON AND THEIR DRESSES ARE FANTASTICLY STRETCHY, AFFORDABLE AND WORK BEFORE/DURING/AFTER PREGNANCY. i’M NOT PREGNANT YET BUT i HAVE TWO OF THEIR DRESSES THAT i LOVE! i RECOMMEND THE THICKER FABRICS. okay so your 20+ week bump looks like my 13 week bump. ha! something about this being my third is probably to blame. i’ve been loving hatch collaction. they’re pieces have carried me through my daughter’s entire pregnancy and the beginning of this third. same goes for sonnet james. their dresses are so comfy and, again, you can wear them throughout your entire pregnancy and beyond. and a lot of the dresses are breastfeeding friendly which is a lifesaver! good luck! First of all, you look BEAUTIFUL and i love the outfit. I have a 6 month old and i took a very similar strategy when i was pregnant – Buying pieces i loveD in a size up (or more) so i still felt like mYself. THese pieces are also great as you transition out of pregnancy, as the baby weight comes off. I did splurge on a few dark wash maternity jeans that i wore a lot, along with leggings. My advice to you is to contInue to marvel at the changes that comEs with Pregnancy. My mind is still blown by the experience. Also, be kind to yourseLf. Your body is doing incredible, amazing worK. Ironically, i never truly APPRECIATED my body until after pregancy and i hope the same for you and other women out there. All my best to you! You are so sweet! Thank you! I love your words about being kind to yourself. It really is important. Thank you so much! I resisted buying any maternity clothing until about the twenty week mark too – when a friend dragged me to a store to get some much needed maternity jeans. They have been the best purchase. So comfortable, and I’m still wearing them now at 36 weeks. I am currently 40 weeks (+3 days) and honestly I only bought ONE maternity item throughout my whole pregnancy. For me, living in Florida and being pregnant through the summer meant I really just needed a pair of denim shorts. They cost me $35 and I wore them alllll the time. Everything else I bought I made sure I could use after pregnancy and I really focused on dresses and tops that would also work great with nursing. I just felt like a lot of maternity clothes out there just weren’t “me” and it was something I wasn’t willing to compromise on, especially since my body was already going through so many other changes! So its definitely doable, and you can still be plenty comfortable AND stylish!